I’m just loving the Spring weather that is coming our way!! Spring is my favorite season, not only because of the weather, but also because of the great pallette of colors that Spring brings. 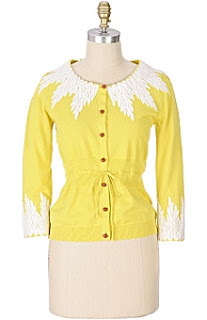 I’m loving this cute yellow cardigan from Anthropologie! I’m liking this color! I’m thinking there will hopefully be some new SPRING inspired jewelry pieces soon! I’ve got the Spring Itch..